I'm intending to add heat to my detached garage. The closest corner of the garage to the closest corner of my house is 65' away. Right now the garage is uninsulated block 2 car garage with future plans to insulate. I can't find any local dealers for underground piping other than Thermopex. The local guy has it for $11.45/ft for the standard stuff. I only plan on running a unit heater in the garage to keep it somewhat warm when I'm in there, so I think Thermopex would supply enough BTU's for it. How's that sound? I'm going to do some changes to my setup anyways. Right now I have 30' of Logstor going from the boiler to the house, then another 30' or so of 1" PEX making a loop to the furnace and sidearm heat exchanger and then back to the boiler. All of that is on a Grundfos 26-99 on low (where a Taco 007 was previously in place and could supply enough heat). I have some 1-1/4" bodied manifolds from my old setup that I want to use. Do a 30' loop to the house, through the manifolds, and back to the boiler using the 26-99 and then use the properly sized circulator for each zone off of that. One loop for the furnace, one for water heater, one for the garage, and another loop for an unheated room in the house that I'm finishing out soon. So 60 ft of Logstor and 30ft of 1" on the primary? Then you wish to add another 130ft of 1" to the detached garage as a secondary loop for a unit heater? How big will this unit heater be? If I understand your setup correctly and it were me, I'd leave the primary as it is instead of complicating it with 2 extra circs but turn the 26-99 up to maintain decent delta T with a full heat call. Then throw a pair of tees in that primary loop with a dedicated circ for the detached garage loop. All this will be dependent on heat load and flow rate though, and nobody can give an educated answer without them. I don't like my current primary loop as it is. It was a quick install to make it work before it got cold one winter 4 years ago or so. I do intend on using the manifolds I have as I liked having control over each loop individually. The sidearm is getting swapped out for a flat plate now that I've filtered and softened the domestic water in my house. 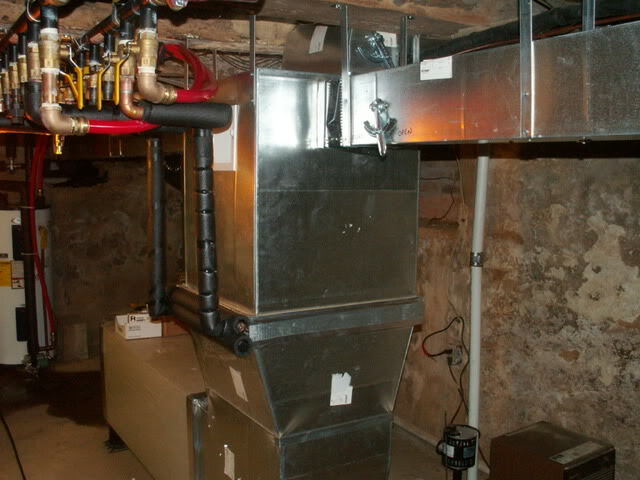 The coil in my ductwork is a 20x20 from FreeHeat4U.com. My boiler runs at 180-160 differentials and with a full heat load being drawn in the house, return temps are usually only 5 degrees drop from supply temps. The unit heater I'm planning for the garage will probably be a "100k" unit heater that will only run while I'm out there or to maintain about 45 degrees in there at least. I might just get another 20x20 coil and bolt a box fan to it wired to a 120v thermostat instead, but that's to be determined later. The currently unheated room I'm going to finish will likely get radiant floors in it, so it'll need a separate loop for a mixing valve anyways. It's a 12x24 room on the end of the house I'll need to finish enclosing and insulating. I prefer to keep the DHW in series with the main loop. If you have it on a manifold, you are wasting power running a pump 24/7 when you are only using water from it probably less than an hour per day. It also wastes a large percentage of the capacity available in the main loop. I'm on board with putting the flat plate and 20x20 coil on the same circuit. The water heater and furnace are in the same room in the basement, so that's no issue. One big reason I was thinking of doing the coil on it's own circuit was for spring and fall days that get really hot during the day and then cold again a day or two later. While I'm still running the boiler, if water is flowing through the coil, I can't run my air conditioner without heating the house via the coil. Almost every spring and fall, there are a few days that I want to do that. The house heats up enough from the sun that it can be over 80 inside pretty quickly. Flat plate: should I install that on the incoming water to the water heater? I keep the electricity on to it all the time. Manifold: I had the unused ports valved off at the old house. It worked out pretty well there. Here's a photo of the old house. There may be some benefit in starting and stopping flow through the coil in the duct if it's convecting heat, every duct is different and some do it worse than others, plus you could auto change to AC. Agree with putting the DHW flat plate in the main loop. I'd put it first in line to avoid fluctuating water temps in the shower. When I redid my system I put the HX on a secondary loop with its own pump, drastically cuts down on temperature creep on warmer sunny days. I have a three minute on-delay timer for the fan so the coil and ductwork has a little bit of time to warm up. A secondary loop or fan coil valve will be required if you ever install a whole house humidifier that controls the fan on a call for humidity. Tell me more about this 3 way zone valve. We used to use the wax motor Taco 3 way zone valves(560 series) had enough get toasted with power surges or leak through the seals that we switched to pumping secondary loops. I'd guess slightly cheaper than the Taco zone valves and seemed to be more reliable. ? I'm curious what brand of zone valve you guys use, maybe there are better ones. A zone valve definitely involves less labor. Others can explain better but a 3 way zone valve is used along with another tee to force flow to bypass a coil until the thermostat calls for heat, then the valve opens and sends the flow around the long way through the heat exchanger. So I could run one loop to the coil and water heater flat plate, but use a 3-way zone valve to turn the coil off when there is no call for heat while the flat plate still gets boiler water? Does the house ever get too warm with the current setup? Most people like the convection heat that the coil puts out since it cuts way back on the blower run time. This can vary a lot by house layout and some houses doesn't work well. If manual bypass is ok, I would run the water to the plate heat exchanger, keeping line full 1"id. Then run full 1" Id pipe to the supply manifold. Then full 1" from the return manifold to the logstor. Then run one loop to the furnace hx with 1" pex and one to the garage from the manifolds. Then do a 3rd that just goes between the manifolds for a bypass. Running the 26-99 pump on high speed should be able to run everything. If you don't want continuous flow to everything then this would not be the way to go.